For Indie Pen-Dance Wednesday and our second indie book for today, we were lucky enough to be given the opportunity to look at Gemma Coles’ excellent “Head Over Heels About…Gymnastics”. Described as “An absolute must-have for anyone with an interest in gymnastics”, it got Charlotte very excited about taking a look at some of the exercises, and giving them a try at home. 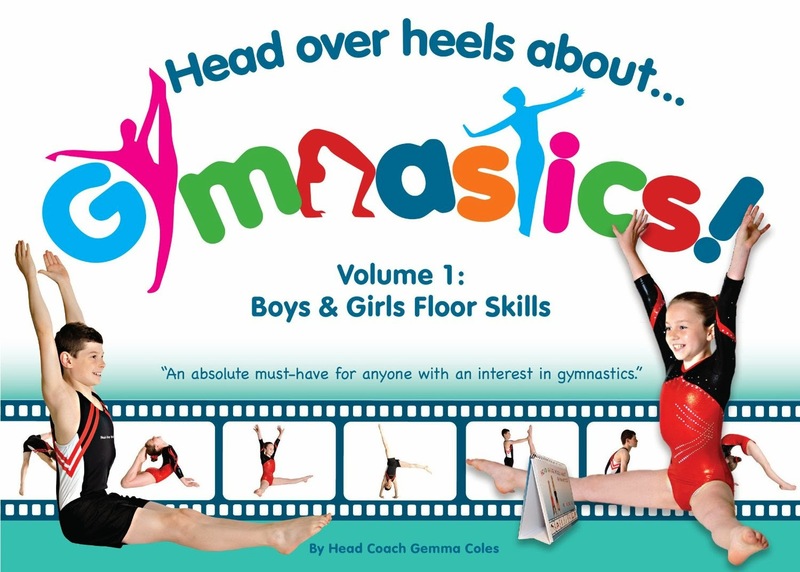 Volume 1 covers floor skills for girls and boys, with brilliant clear photography and progressive ‘shadow moves’ to demonstrate each move in detail. Of course, most important is a section on warming up and stretching, and we emphasise this strongly for the purposes of our review, the book should be used with supervision for younger children. It’s hugely encouraging, and Charlotte liked the idea that the book ‘stands up’ (and hooray, it’s spiral-bound too – so it stays put for you to be able to concentrate on move progression without having to juggle with the book while you do so! What? How does she do that? I can’t do that! Charlotte does Ballet at school and is very active, so the book was definitely of huge interest to her. She now wants to do gymnastics at school as soon as the more organised programmes begin (her school do a gym class but it’s fairly informal and doesn’t have the structure that the books demonstrate so well). 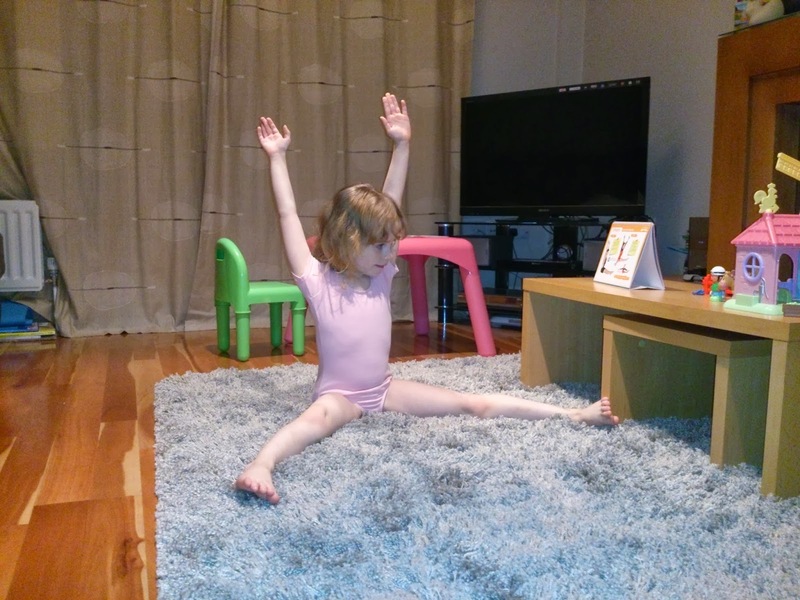 Charlotte demonstrates a warm-up straddle stretch. 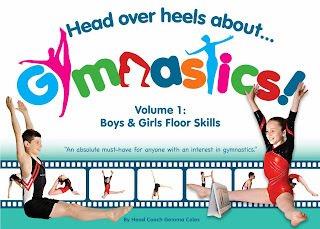 When someone is as passionate about what they do as Gemma obviously is – and puts their expertise and knowledge into a book like this, it really shines through, and provides a fantastic accompaniment to gymnastic classes or even offers pointers to children and parents who may want to try out some of the simpler moves themselves before progressing to organised classes in and outside school. It got a huge thumbs up from all three of us (Charlotte, my wife and me of course) and anything that positively encourages children to take up physical activity in such a fantastic way is definitely worth looking into. Here’s Charlotte again with the second part of her routine. What a little star! Charlotte’s best bit: All of it! Particularly putting a routine together, and doing teddy bear rolls. Daddy and Mummy’s Favourite bit: A hugely positive response from Charlotte to a book that really does capture the essence of gymnastics, and presents it in a clear, concise and above all fun way to inspire children to get active!